Headamp Pico Portable USB DAC review | What Hi-Fi? Headamp is a small US company that specialises in headphone amplifiers. 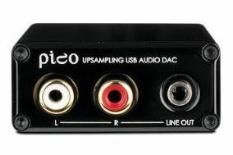 The Pico range (supplied by ampcity.co.uk) consists of three tiny products: a headphone amp, a headphone amp with a USB DAC, and this straightforward USB DAC. Measuring just 7x2x5cm and with a weight that barely registers on scales, the Pico is amazingly portable – and it takes its power from the mini-USB socket, so needs no external power supply. Once music signals come in via this sole connection, they're fed through a Wolfson WM8740 DAC and passed out via the stereo RCA and line-out connections. Sonically, the Pico's key ability is its organisation. Instruments stand separately in the soundstage, and are extremely well defined. This allows you to concentrate on and enjoy the individual strands – but it also combines with slightly imperfect timing to reduce the cohesiveness of the track as a whole. So, while it's able to track the twinkly guitar of Wild Beasts' Still Got the Taste Dancing on our Tongues, it doesn't gel perfectly with the bassline and vocals. This track also illustrates a lack of dynamics. The Pico doesn't have the range or agility to do the quick shifts, or the subtlety to properly recreate the nuance in the occasionally bonkers vocals. Still, the precision and cleanliness of its instrument placement and definition will make it very appealing to many, and although it doesn't quite have the bass depth or weight of some rivals, it's impressively solid, particularly through the midrange. So, if portability is your first priority when buying a DAC, or if your enjoyment of music is centred on a particular instrument, by all means give the Pico a go, but where overall sonic presentation is concerned, you can buy better for less.